I.B.M. is reshuffling its top management one level below the chief executive, Samuel J. Palmisano, giving greater responsibility to four senior executives. The move announced Monday, analysts said, creates a short list for succession. But it could also signal that Mr. Palmisano would be staying on beyond the traditional retirement age of 60 for I.B.M. chief executives. Mr. Palmisano turns 59 later this month. The reorganization came as I.B.M. reported a solid profit gain in the quarter and raised its forecast slightly for 2010. But the company’s stock fell in after-hours trading amid concern about future revenue and how quickly corporate spending on technology was picking up. The management changes, announced in an e-mail message to I.B.M. employees, were intended to improve the company’s products and services, Mr. Palmisano wrote. For example, computer hardware and software are for the first time being placed under the oversight of one executive. 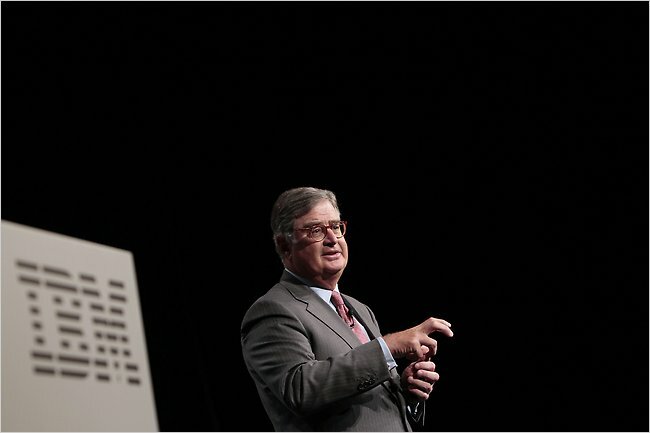 Increasingly, Mr. Palmisano wrote, computer systems must be “designed and brought to market as tightly integrated” packages of hardware and software. Steven A. Mills, a senior vice president, will be in charge of the hardware and software divisions. But Mr. Mills is 58, and not a likely successor, analysts say. Mark Loughridge, 57, the chief financial officer, is being given a larger role overseeing finance, the company’s financing unit, and internal information technology. But his experience at I.B.M., analysts suggest, has been too limited to make him a likely successor. In its earnings report, I.B.M. reported a profit of $2.61 a share, up about 13 percent from the year-earlier quarter. The profit performance surpassed the $2.58 a share consensus estimate of Wall Street analysts, as compiled by Thomson Reuters. But I.B.M. reported a sluggish revenue increase of 2 percent, to $23.7 billion, below Wall Street’s forecast of just under $24.2 billion. In the year-earlier quarter, I.B.M. reported revenue of slightly less than $23.3 billion. New contract signings, the seed corn of future revenue in I.B.M.’s huge services business, also came in well below analysts’ expectations, at $12.3 billion. A. M. Sacconaghi, an analyst at Bernstein Research, had forecast signings of $14 billion. The revenue shortfall and softness in services signings, Mr. Sacconaghi said, raised doubts about the strength of the recovery in corporate technology spending and how much I.B.M. would benefit. “Investors were expecting more,” he said. In after-hours trading, shares of I.B.M. fell as much as $5.58, or 4.3 percent. I.B.M. raised its earnings forecast for the year to “at least $11.25 a share,” up from $11.20 a share. Analysts are watching whether companies might trim their earnings forecasts, especially given weakness in Europe and an uncertain American economy. Mr. Loughridge noted that the strong American dollar shaved revenue in the quarter by $500 million. Services signings, especially on long-term contracts, he said, were often uneven quarter by quarter. And an increase in signings by new customers during the quarter, Mr. Loughridge added, should lead to more new business in the future. Services revenue rose 2 percent, to $13.7 billion. In the software business, where sales rose 2 percent to $5.3 billion, sales of the company’s Websphere Internet-based software rose 17 percent. In the hardware division, mainframe revenue declined 24 percent, and sales of large computers running the Unix operating system fell 10 percent. But new mainframe and Unix models are being introduced soon, opening the door to a possible rebound in hardware sales. I.B.M. is a partial barometer of business investment trends, as the largest supplier of information technology to corporations worldwide. Information technology — computer hardware, software and services — accounts for more than half of all private capital investment. The technology sector has been leading the recovery, and investors were encouraged last week when Intel, the big chip maker, reported that its revenue rose 34 percent in the second quarter. I.B.M. is less tied to the cyclical swings of the hardware business than many technology companies. The more stable services and software businesses now account for 80 percent of I.B.M.’s revenue, as the company reduced its dependence on hardware in recent years. As a result, I.B.M. suffered less than many high-technology companies in the recession. I.B.M., analysts note, focuses mainly on double-digit earnings growth and less on rapid revenue growth. “I.B.M. has had an unrelenting focus on expanding its higher-margin businesses in software and services in recent years, and caring less about revenue growth,” said Carl Claunch, an analyst at Gartner Research.